In this review of MyPCBackup, which is an industry leading online backup company, we’ll discuss many of the features, pros and cons, and more. If this is the first time that you have heard of this type of service, or you are just beginning the research process, below you will find a detail explanation of exactly what an online backup company does, and how they can be beneficial to you personally, or to your company. Essentially, all valuable computer files that are stored on any computers hard-drive, need to be backed-up in order to ensure that you will have access to them, when you need that data the most. It is almost impossible to explain each and every way that you could lose your files, but we will mention a few, which are; your computer could be hacked, your hard-drive could malfunction and you could lose access to it totally, or in the worst case scenario, your computer could be stolen. Hopefully, none of the above ever happens to you, but each example mentioned previously, is a real life story that has produced devastating effects for many individuals and companies in the past. The ones that were prepared, by using an online backup company to secure their critical data, were able to get through the tragedy just fine, the ones that weren’t, well, you know what happened to them. 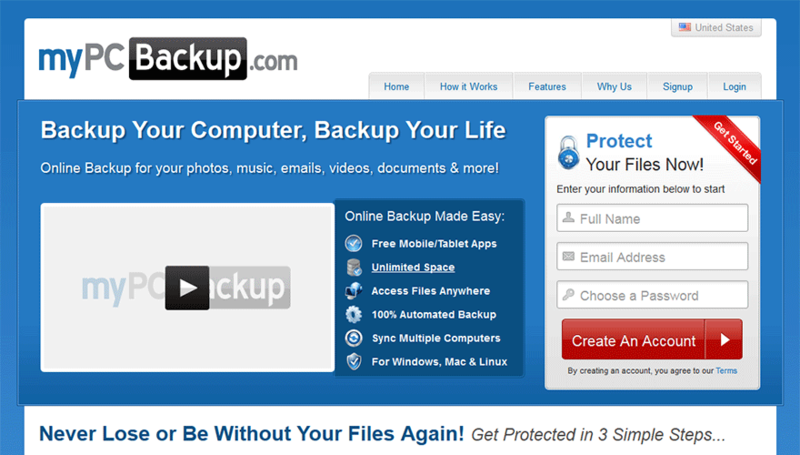 MyPCBackup is the perfect solution for personal online backup. MyPCBackup provides access to your data via all cellphone platforms, has all of the most popular customer support options, and has an A+ rating by the BBB. MyPCBackup is not a solution for large business needs based on their current feature set. The online backup company MyPCBackup pricing structure works in the following way. It is $9.95 a month, if you pay monthly. If you pay six months in advance, the monthly cost drops to $6.95. If you feel comfortable with your decision, you can pay one year in advance, and the monthly fees will be reduced to $5.95 a month. The lowest possible rate per month is $4.95, and you only get that, if you pay two years in advance. MyPCBackup for small business would be a good cost effective solution to protect your business from potential data loss due to catastrophe. For individuals, MyPCBackup is priced reasonably well and is, without question, a very secure solution for your backup needs. The online backup company MyPCBackup provides 24/7 email support. As with all of our reviews, we decided to test out their personnel, in an attempt to determine how efficient they would be. We emailed them a few tough questions about their system, and we are happy to report, that in less than 15 minutes we received our first response. We then decided to up the ante on them, and pretended that we were not a native English speaker, by asking our questions in a manner that somebody would who did not have a very good comprehension of the language would. All we can say, is that if you cannot write in English very well, make sure you have access to somebody if you need to use the online backup company MyPCBackup customer service department. What you are attempting to do is to fully integrate your onsite computer, with a server that is located at another location. By definition, this is not an easy process, unless the online backup firm’s software that you are utilizing is not only highly sophisticated, but also extremely simple to understand and to operate. We are very happy to report, that the online backup company MyPCBackup software is a breeze to install and to get up and running properly. We believe that it is right up there with the best that we have ever tested, and we think that even a computer novice should have no problems getting it functioning correctly. The next step, which you are going to have to do, is to create a schedule for your data to be downloaded and stored on their servers. Once again, all you will need to do is to read their very detailed instructions, and simply hit a few buttons with your mouse, and you should have everything working suitably, in no time at all. After you have done everything mentioned above, your information will be automatically backed-up each and every day at the time you have specified, and you will have access to it from any computer in the world, if you so desire. If the Pentagons computers can be hacked, there is not a computer system in the world that it cannot happen to. That being said, there is no doubt that the online backup company MyPCBackup is far more secure than any personal or business computer. They utilize some of the most sophisticated technology known in the world today, to attempt and fully protect all of their client’s information. This includes multiple lawyers of firewalls, extremely complicated encryption software systems, and other forms of the defenses that they will not reveal. To use the online backup company MyPCBackup you will need to have a Window’s operating system that is either 7, 2000, XP or Vista. It does not matter if your computer is 64 or 32 bits, it will operate with either. Presently they do not support Apple computers, but maybe sometime in the future they will add this option to their system. Currently, you can backup almost any type of legal to own date that you wish on the online backup company MyPCBackup severs. This includes software, executables, graphics, documents, video, music, and pictures. If you have read this far in our review for the online backup company MyPCBackup, you must really want to know what we think about the firm. We like them; in fact, we like them quite a bit, and think that they are without question a top player in this exciting and growing industry. If you are considering an online backup option for either yourself, or for your company, we believe that you should strongly consider the firm MyPCBackup, as your primary alternative. Of course the final decision is up to you, and we do recommend that you research the other top rated online backup companies thoroughly.